the tradition of determining a king of marksmen goes back to the ancient times of celtic and early teutonic guilds. the use of a wooden shooting target instead of lively one inspired artist to create individual objects. here you find a series of folksy handpainted versions dated to be early beginning of the last century. a historical shooting target symbol is an artwork with a bird´s shape. In the 18th century a wooden disc prevailed as preferred option and offered artists a large variety of design possibilities. contemporary topics were as popular as daily life scenes and turned out to be a temporary fashion. although modern technical progress has nearly replaced the virtual use of wooden shooting targets their tradition is still alive. 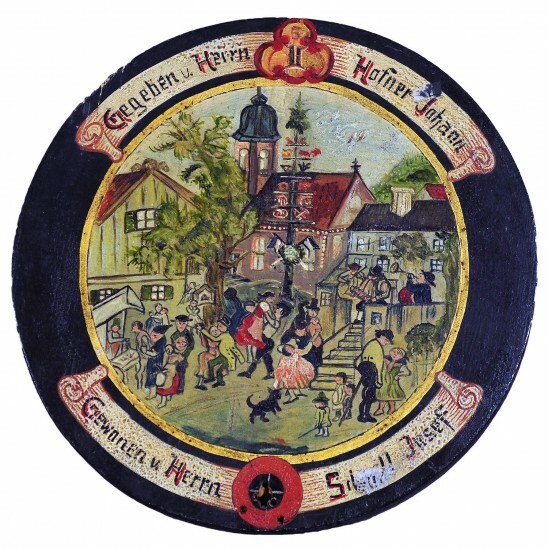 find some interesting examples of bavarian hand painted shooting targets with lovely scenes of village live from the beginng of the 20th century.